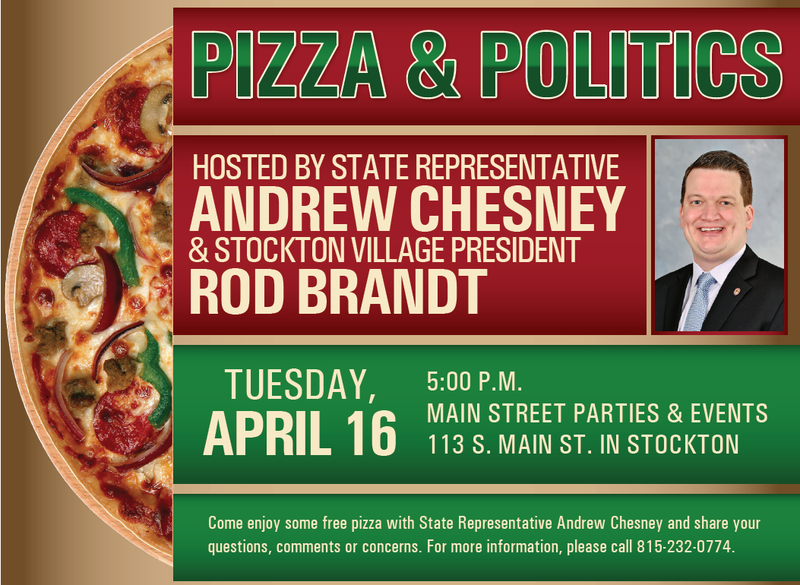 State Representative Andrew Chesney announced he, along with Stockton Village President Rod Brandt, will be hosting a casual “Pizza & Politics” event in Stockton the evening of Tuesday, April 16. “During the Illinois General Assembly’s Spring Break, I felt it important to provide an opportunity for taxpayers to come out for an evening, receive a quick update on state issues and provide an opportunity for questions and answers about top state issues,” said Chesney, the first-term legislator serving the 89th House District in Northwest Illinois. “Even if you don’t have a specific concern, this is a good opportunity to learn more about legislative actions and an outlook on what’s to come with a new Governor and many important issues for the state to resolve,” Chesney continued. The Pizza & Politics Event will take place on Tuesday, April 16 at Main Street Parties & Events, 113 S Main Street, Stockton from 5:00pm to 7:00pm. Admission is FREE, families are welcomed, and pizza, lemonade, pop and water will be served from Corner Tap in Stockton. No RSVP is required. If you have any questions, please call Sally in Rep. Chesney’s Freeport Office at 815-232-0774.